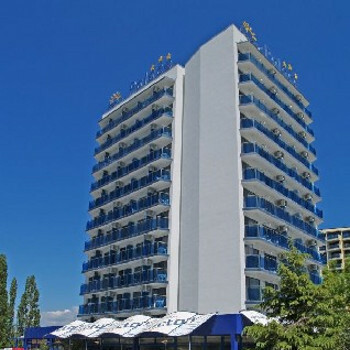 The Palas enjoys a stunning seafront location along the resort’s main promenade, and is only a pleasant 15 minute walk from the centre of Sunny Beach. It offers bright and comfortable accommodation and friendly service. This is finally a review that is actually going to be the truth. We stayed in the palas hotel for a week, as soon as we arrived the staff were very helpful and couldnt do enough for us, they made us feel welcome straight away. The hotel was spotless, there was always someone cleaning every second of the day. The food was nice but you had to get down for breakfast asap as it went quickly and there were big queues for the coffe machine. There was one slight disappointment, as we had to pay to use the sun loungers. All in all the holiday was a great success and I have never been anywhere where the staff have been so friendly. I would definetely stay in this hotel again. I travelled with my boyfriend in the last week of July and stayed for 1 week. I gave the hotel cleanliness a s star as the towels in the room only get changed every 2nd day!!! The location of the hotel is great, its straight on the beach front. The staff are ok, they keep to themselves and work really long hours!!! The food isnt the best, we only ate in the hotel once, but we are both very picky eaters! For a 3 star hotel, I did find it good. The pool area ia fairly small but the beach is literally outside the door so if you dont get a sun lounger at the hotel, you will at the beach. my holiday in bulgaria was definetly the best holiday i have been on in a long time, we stayed in the palace hotel which is in a really good location close to everything!the hotel was basic but clean.it had a very good cocktail bar outside(hi bero and nick)! !and the staff are absolutly amazing.The food at breakfast was average, it stopped at ten every morning,exactly at ten.one morning i was refused breakfast even though it was just before ten(9.59)!! !one of the staff very cheekily told me to come earlier in future and he would give me breakfast, even though i could clearly see food out and water in a dispenser i wasnt allowed any!this was not the way a guest should be spoken to and i was not best pleased but the rest of the staff were so lovely i cast a blind eye on this particular mans attitude.the food in the resterant of the hotel for lunch or dinner was very nice, but like all bulgarian resterants everything is served with cheese..absolutly everything!the nightlife in this resort is absolutly fantastic and the drink is so cheap it is unbelievable!and measures are nearly too large which was good on the night but not so good on your head in the morning!the main nightclubs i would recomend are lazur and orange, lazur is huge and has swimming pools and is very good craic!orange is very near the palace hotel(5 min walk or less)and ladies get in free before twelve!also club XL is good enough but not as good as lazur..we also went to iceburg but it was more for people with an interest of rock music. with regards to the location of the hotel it is on the northern side of the resort but you can easily walk down to the middle of the resort in 10 mins,and taxis are quite cheap so it is easy to get around.there is also a little train which stops at the back of the palace hotel it is two lev each and it goes all around the resort and you can hop on and hop off so it is a cheaper way of getting around and a good way to see the town!the hotel is practically on the beach which is amazing and the sea breeze was lovely even when sitting by the pool(with a nice pina colada!)haha! overall the holiday was amazing and i would highly recomend anyone from any age group to go! Please avoid this awful hotel. We upgraded after 3 sleepless nights. The walls and floors are paper thin. The other guests were loud and rowdy all night. Reception staff couldn't care less and were very rude. The rooms are tiny and the bathroom is a box. The shower is a head sticking out of the wall which floods the whole room and leaves the floor dangerously slippy. The toilet howls for about 20 mins after flushing. You can easily walk from one balcony to the next which means no privacy and could potentially be very dangerous. They charge you to sit around the pool - 5 lev per person per day. If you must go to Sunny Beach book 4star plus. The hotel we moved to was the Grand Hotel and was very nice. Hotel nice very clean room. Very small bathroom and very basic. Food. Was cold or luke warm so we ate most nights it was so cheap to do so. The food was so nice lots to choose from. The staff are great too. The room was a little small for three people all right if the child is only small, but over all it was a great hotel. Spot on to go to the beach as you are so near to it. There is a singer on every night which is good and all English songs too. The staff at the hotel are very good. I will be going again sometime. My first impressions of the hotel weren't exactly high, the first thing you notice is the horrible bright blue plastic furniture in the 'lobby'. The room was very basic but it had everything you needed and was very clean. The only thing I can complain about in the room was the bathroom, the shower basically consisted of the shower attached to the wall, there was no shower curtain and the base of the shower was just the floor. This meant absolutely everything in the whole bathroom got absolutely soaking each time someone had a shower, especially as the toilet and sink were about 30cm from the 'shower area'. So my advice is put toilet roll and towels outside the room until you have finished showering and be careful because the room is lethal when wet-my boyfriend almost killed himself slipping on the drenched floor! The next area for complaint in my opinion was the food. To be honest the breakfast wasn't too bad, there was bread for toast, a small selection of cereal, melon, cherries, chocolate croissants etc which was all nice but the English breakfast wasn't really up to my standard. It looked awful and tasted just as bad. I will admit that I only went to the evening meal on the first night, so I can't give you a very informed opinion, but there was a reason i only went once. This was because I thought it was diabolical. Sure you could live off it but it wasn't an enjoyable experience. It didn't look nice - which puts you off for a start but most of it was cold and there wasn't much choice at all. About 2 meat choices like fish and chicken which didn't look appetising. I would advise anyone who likes good food only to book here if they can afford to eat out every night-luckily we anticipated the food may not be that good in a 3* so took money to eat out. The resort has great restaurants which are dirt cheap so you won't find a problem there. I only saw one example of entertainment, which was a woman singing in the restaurant, obviously not a 19 and 23 yr olds cup of tea! We stayed in hotel Palas 1st 2 week in June on half board. The room was basic but the view from the balcony more than made up for that. The hotel itself was spotless everywhere you looked there was someone with a mop or duster in hand. The food was awful both breakfast and evening meal the choice was limited unappetizing and usually cold and repetitive, we ate out a few times as it was so bad. This was a great Hotel for Location a little spartan but clean and friendly. Food was acceptable and waiting staff excellent. We willbe visiting again this year.